EPOSNOW the leading value EPoS system distributor release new dual core touch screen EPoS retail systems pre-configured for small and medium businesses. 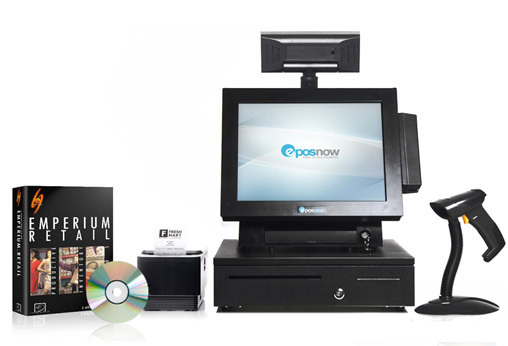 Eposnow.com, the fast growing EPoS system specialist has partnered with Emperium Retail software to create the their pre-configured retail epos system. This great value combination features the newest Intel ATOM Processor with 2 GB of fast DDR RAM. Although the retail EPoS Now systems possess the best in class hardware and software; the company are more widely known for their superior customer service. We spoke at length with the companies customer service director and he told us, ‘We will pre-configure the system(s) and pre load your products if required. It is the perfect EPoS solution for a single or multi retail EPoS systems installation. Our EPOSNOW retail EPoS System is perfect for most retail establishments. We have installed these systems in convenience stores and newsagents, trade desks, cash and carry as well as supermarkets and multi- shop retail business.’ He said. With over 10 years of experience the Eposnow.com staff are experts in point of sale hardware and its accompanying software. The prices on their equipment, systems and supplies is the very best on the internet today. The after sales support staff are well known for checking up with their customers and providing exemplary customer service. The supply side of the business offers magnetic swipe cards, bar code printing labels and thermal receipt printer paper for all their machines. In addition to all these services they also provide financing subject to status. EPOSNOW are a national internet based retailer and manufacturer of EPoS systems and supplies. They have the most up to date equipment and software available allied to leading after sales service. Visit http://www.eposnow.com for more information. You will be able to ask questions via the live chat offered when the site first loads up. Eposnow.com can also be reached by phone 0845 2997707.